reviews of "3 minutes to midnight"
Guitar Player Magazine: "The classically trained maestro, renowned for seamlessly blending various Latin styles...incorporates new plucking techniques to play aptly timed flourishes at supersonic speeds that will make your head spin." Full Interview here. GUITAR PLAYER MAGAZINE Interview here. Midwest Record: "Firmly staking out his territory as a world beat guitarist par excellence, he avoids all the clichés and weariness that his contemporaries seem to fall into after making this many releases and makes you remember why you became a guitar fan in the first place." Full review here. ACOUSTIC GUITAR MAGAZINE interview here. Jazziz Magazine: "Lawson Rollins has built a global following with his virtuosity and an engaging sound that incorporates jazz and world rhythms." Full article here. AXS.com: Top 10 Jazz Albums of 2015: "An international contemporary jazz star, Lawson Rollins rolls up his sleeves for his fifth album to bring places like Madrid, Paris, Berlin, and the Bayou to life." Full review: here. Midwest Record: "Acoustic music doesn't get any hotter than this." Full review: here. Jazziz Magazine: "Sparkling, intricately finger-picked acoustic guitar." Full review: here. MusicWeb: "Guitar maestro Lawson Rollins reaches a new musical zenith." Full review: here. Smooth & Soul: "A virtuoso of the Spanish guitar, he thrilled with his fire." Full review here. iTunes Editorial: "Fiery...very much of the moment." Full review here. Jazz Weekly: "Guitarist Lawson Rollins is one of the few out there that can bridge the gap between jazz, world and smooth." Full review here. Inside World Music: "A truly exciting journey." Full review here. SmoothJazz.com: "The versatile, melodic and delightfully grooving guitarist, whose YouTube videos have garnered nearly eight million views, bridges countries, continents and cultures." Full review here. Guitar Player Magazine: "The nylon-string virtuoso who blew minds with his "Fire Cadenza" is back." Full review: here. AXS.com: "Technically beyond compare, yet uniquely his own sound-smith" Full review here. Smooth Jazz Ride: "Big on sound, big on worldliness, big on conceptual structure, and big on appeal." Full review here. Guitar Player Magazine: "On his latest, he still displays the lilting melodies, strong compositions, and otherworldly chops that characterize all of his work...Simply dazzling." Full review: here. Jazziz Magazine: "Rollins' pristine and masterful picking on acoustic and electric guitars is the common thread running through all his work...mesmerizing." Full review: here. MusicWeb: "One of the most accomplished and creative World Fusion guitarists on the planet today...on Full Circle Lawson arrives at something that borders on sublime, instrumental, pan-global guitar-centric jazz that is truly colorful and invigorating. Surely Lawson's most well-rounded album yet." Full review: here. Smooth & Soul: "The energetic opener 'Momentum' instantly got me on-side and from this moment Mr. Rollins could do no wrong. His sound is clear, his fingerstyle is precise and his runs are dizzying." Full review here. ABBYSJazz: "Rollins guitar work is amazing...creativity + superb skill = Full Circle. A profusion of interesting musical styles. Strongly Recommended." Full review here. Jazz Weekly: "Tight and exciting." Full review here. Inside World Music: "American guitarist extraordinaire, Lawson Rollins...The scintillating melodies are timeless and free-flowing. Anyone with an interest in acoustic guitars and instrumental music will find happiness in Lawson's latest release." Full review here. SmoothJazz.com: "You'll find all that you've come to love about this extraordinary American musician on FULL CIRCLE, fluid playing with fiery speed and beautiful accuracy! To define the sound is to rob it of grandness...just listen and let go!" Full review here. MainlyPiano.com: "To say that it is breathtaking is still a complete understatement...a stunning album." Full review here. ImproviJazzation Nation: "Music created with passion and talent...that's exactly what Lawson is doing here...There are an even dozen high-spirited tunes full of soul and groove that will haunt your playlists for a long time to come." Full review here. Independent Jazz Buyer's Guide: "Lawson Rollins' fourth recording on his own Infinita label shows why the North Carolina-born classically-trained guitarist has drawn a world of critical praise from those who know and love guitar music. This cat can play like nobody's business and this record proves it." JazzHQ: "Prodigious guitarist Lawson Rollins is your tour guide on 'Full Circle,' a riveting global adventure crammed with culture and masterful musicianship." Full review here. Critical Jazz: "[An] amazing sonic tapestry...other artists have attempted similar releases but the results fall short by comparison. 'Full Circle' cuts a wide path for world music fans, classical aficionados and jazz lovers of any genre. An amazing release and proof that when the stars are in perfect alignment, magic is indeed possible." Full review here. Smooth Jazz Ride: "Nimble-fingered with lightning speed and possessing a full grasp of the cultures of the world as voiced through his guitar, Lawson Rollins wears his captivating music like a second skin." Full review here. Guitar Player Magazine: "He possesses ungodly classical chops, with dazzling speed, uncanny accuracy, and a beautifully delicate touch...Lawson incorporates jazz, Brazilian, Latin, and world music influences into his complex musical stew, making for an intriguing listen." Full interview and review here. Inside World Music: "Another astounding album of world fusion and avant-garde jazz...Rollins reaches new musical heights." Full review here. Vintage Guitar Magazine: "Even 'world music' seems an inadequate blanket to wrap around what Rollins has created here. But whatever it is, he is a master of it." Full review here. Wandering Educators music critic Dr. Jessie Voigts: "Lawson has crafted a work of pure genius." Full review here. Jazz review website Straight No Chaser: "Elevation, the latest CD from finger picking guitar whiz Lawson Rollins, is a true world music album." Full review here. Midwest Record: "This is right in the center of the winner's circle of adult listening albums to come out this year... it doesn't get any better than this." Full review here. 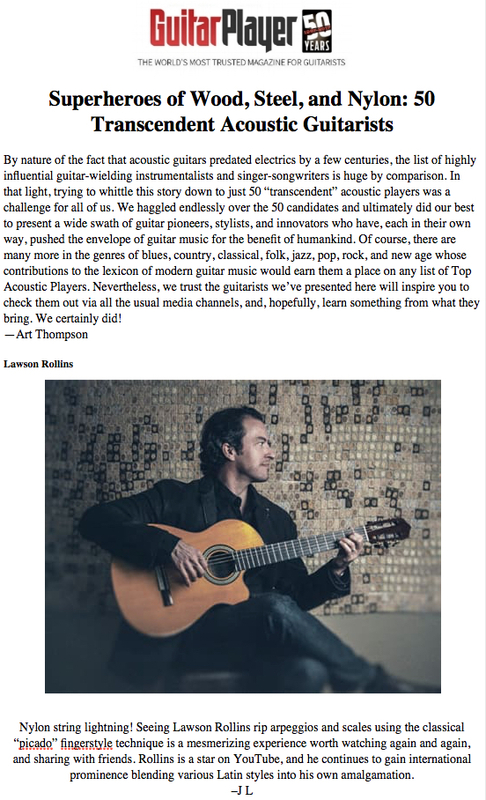 Guitar World Magazine: "It's not often that a Latin jazz/flamenco/samba guitarist generates millions of views on YouTube with short instrumental pieces, but Lawson Rollins is used to defying expectations." Review and interview are here. Don't miss the in-depth interview here with Music Web's guitar-guru Robert Silverstein, who described ELEVATION as "one of the great instrumental guitar albums of 2011...a masterpiece of high guitar art.". The All Music Guide describes ESPIRITO as an "extraordinary musical trip...splendidly exotic, infectiously melodic," and states, "This nonstop engaging festival on disc is overloaded with the glorious spirit its title refers to. " Full review here. Jazziz Magazine writes: "Rollins continues to refine his cross-cultural blending, as he musically travels from Havana to Cape Town to his own Piedmont region. The rousing opener, "Rumba del Sol," provides a promise of the masterful string work to follow." Full review here. Vintage Guitar Magazine writes: "Lawson's take on the genre features fiery guitar chops and lush, full-bodied orchestrations...Lawson's highly polished approach to guitar playing will impress anyone who appreciates a player with a broad creative palette and finely honed technical expertise." Full review here. Music Web Express states: "One of the preeminent acoustic guitarists in America today... When it comes to nylon string neoclassical flamenco work, few can touch Rollins. Lawson's latest CD is a full-fledged production featuring a number of gifted players...a thoroughly enjoyable hour or so of instrumental music magic." Full interview and review here. Mainly Piano music critic Michael Debbage writes: "Espirito is an album that truly expresses a global musical landscape of what World Music should be all about...Rollins continues to separate himself from his peers creating a unique musical tapestry of his own that shines ever so brightly." Full review here. Included on Mainly Piano's Best of 2010 List. World Music Central writes: "With Rollins' guitar at the helm of a topflight musical crew, the result is layered, sophisticated, evocative pieces that combine styles and cultures craftily and expertly." Full review here. Inside World Music writes, "A truly 'world music' journey across styles, countries, and sounds. The intrinsic musical abilities of all involved shine through on every track. Espirito is an album made with all the right ingredients for a delicious result." The International Review of Music states: "On this latest album, Rollins continues to apply his prodigious technique to a far-reaching collection of material. Espirito reaches beyond the familiar areas of Latin jazz with some adventurous compositions and stirring solos...the album is pieced together with purpose and love of music from all corners of the globe." The Smooth Jazz Ride writes: "A consummate diverse production of great quality...Rollins does know his way around the Spanish guitar and shows how to clearly read and absorb the cultures of the world in doing so." Full review here. Washington D.C.'s Hill Rag writes: "Guitarist Lawson Rollins meticulously chisels his skill, culture and passion into his most ambitious album, Espirito." Full review here. Wandering Educators music reviewer Jessie Voigts writes, "Lawson has done an incredible feat, joining cultures, musicians, and the world into one joyful cd. His jazz and classical guitar influences, along with his supreme technical proficiency, combine to make one of the best cds I've ever heard. " Full review here. Smoothjazz.com writes, "ESPIRITO, the second solo masterpiece from guitar virtuoso Lawson Rollins...an adventurous amalgam of musical cultures. Having been blown away by its initial spin, it was on subsequent visits where I found the vibrant playfulness of Lawson's musical mastery truly revealed." Full review here. All About Jazz writes, “Excellent stuff here from Rollins, once again...His guitar work is even more dynamic and dramatic than the predecessor.” Full review here. Midwest Record writes, “A master guitarist and a snazzy writer, Rollins has come in with a tonic for jaded adult ears that need some playful passion to shake off the dust. First rate throughout.” Full review here. First View describes ESPIRITO as, “A feast of classical acoustic guitar and world music.” Full review here. Jazziz Magazine: "Rollins goes from soothingly slow to furiously fast and peppers the project with worldly contributions." Jazzreview.com describes INFINITA as “a warm, diverse, and colorful winner.” Full review here. All Access Magazine reviewer Mike Cavanaugh wrote, “I am so overwhelmed by the musicianship of this CD I find myself somewhat speechless, a rarity indeed…Rollins’ guitar playing is outstanding and the song collaborations with internationally recognized musicians is phenomenal.” Selected as one of their top 10 ‘Best of 2008′ albums! Smoothjazz.com reviewer Sandy Shore writes, "This outstanding album is a richly decorated tapestry of jazz and World Music...There’s such great depth to all eleven tracks, don’t be surprised if INFINITA takes up permanent residence in your car CD player." Rollins’ guitar work, a bright sound with purpose." MainlyPiano.com describes Rollins as a “breathtaking guitarist” and states, “Rollins has created a wonderful musical experience that it is a kaleidoscope of genres.” Rated as one of their top 20 albums of 2008.